Name of the company Siam Tone Co., Ltd. Establishment 18 January 1989. Earth drill is commonly used for bored pile construction in soil in the open area. The diameter of pile is up to 600 - 1,500 mm. to a depth of 70 m.
Reverse circulation drilling is suitable for construction of large diameter pile and extra long. The diameter of pile is varies up to 600 - 2,500 mm. to a depth of 200 m.
All powered casing jack can be bored in boulder and rock by full perimeter rotary and full hydraulic drive with a high degree of vertical accuracy. The diameter of pile is varied up to 800 - 2,000 mm. to a depth of 30 - 50 m.
Direct Circulation Drilling is able to work in limiting area and narrow place. The diameter of pile varied up to 350 - 1,000 mm. to a depth of 30 - 50 m.
Diaphragm wall is generally reinforced concrete wall constructed in the ground for deep basement or retaining wall. The wall of thickness is 800–1,000 mm. Up to a depth of 45 m.
This is mixing inside soil with self-hardening and reinforced by H-beam for construction retaining wall. The advantage is reduce cement material used, less soil remains and free from disposal trouble because not used bentonite slurry during the process. The lapping thickness is varied up to 600–800 mm. to a depth of 20 m.
Pile wall is suitable for construction deep basement or retaining wall in hard ground. The lapping thickness is varied up to 600–800 mm. to a depth of 30 m.
Off shore bored pile construction requires for various supporting and good arrangements. 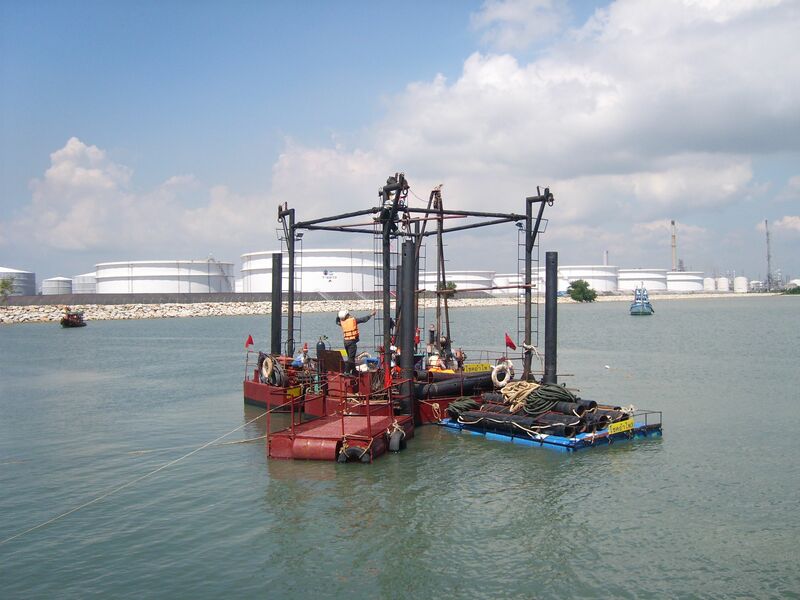 We have many experiences for working in various working stages such as pontoon, jetty, temporary working platform topo of pile and back filled land with various type of drilling such as Earth Drill, Reverse Circulation Drilling and All Power Casing Jack. 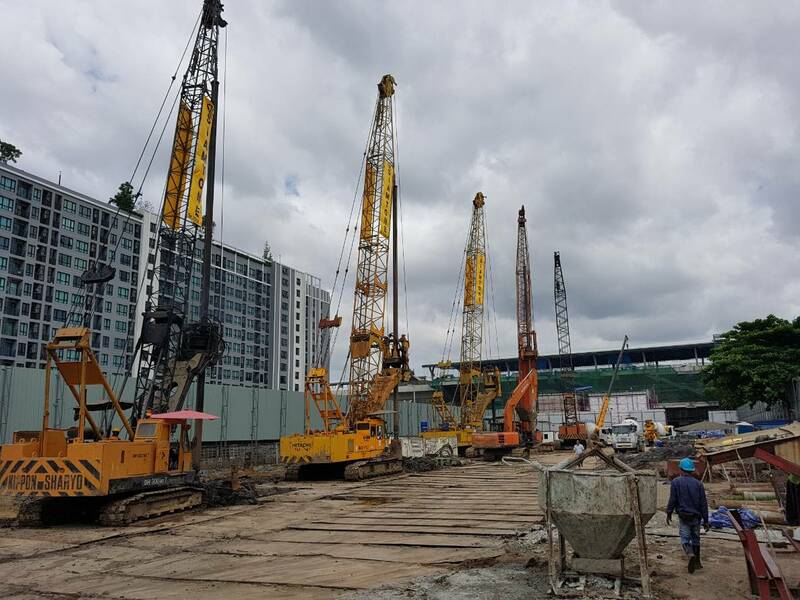 We have rewarded many contracts for ground improvement by grouting such as dam grouting, foundation treatment, jet grouting, soil cement column, grouting for ground anchor and etc., not only in Thailand, but also in oversea as well. Coring is a drill to collect cylinder of soil or rock material. We have various type of core barrel available such as wireline, double, single tube with various size of core up to 150 mm. And various type of drilling machine with maximum drilling depth up to 800 m.
Geotechnical investigation is performed to obtain information on the physical properties for soil and rock for foundations and earthworks design. It includes surface exploration, soil and rock sampling, in-situ test, laboratory tests and geophysical exploration. We perform the investigation both on ground and off shore not only in Thailand and also in oversea especially the country in South Pacific Ocean such as New Guinea, Solomon Islands, Fiji, Vanuatu and etc. We have equipments for extraction many kind of piles such as driven concrete pile and bored pile. Our method has less vibration and noiseless and guarantee full length of pile will be retracted. The pile will be fully drilled cover with casing by all powered casing jack or casing oscillator and then the pile will be retracted by grab hammer or break all the pile by chisel. In addition to our available of various machinery and equipment, have enable us to perform various type of challenging and remedy work such as pipe jacking, horizontal drill, ground anchor installation drilling for observation hole, drilling for ventilation hole, repair damaged pile, CB grout for remove sheet pile, drilling for install ground bed anode and etc. This method has developed to reduce the environment effect to vicinity. 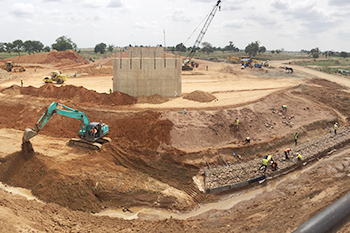 This can be bored with less vibration and noiseless and also less soil remains and free from disposal trouble because not used bentonite slurry during the process. This method is mixing in-situ soil with self-hardening and reinforce by H-beam. The diameter of pile is varied up to 600-800 mm. 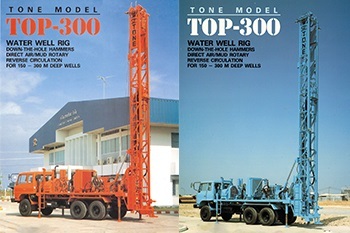 to the depth 20–30 m.
There are various type of instrument require for construction site which need various size and type of drilling for its installation. We perform drilling for instrumentation such as inclinometer, plumb line, piezometer an etc. Name of the company Siam Tone Co .,Ltd. Establishment 18 January 1989. Deeper aquifer of groundwater in Bangkok and its vicinity is varied depth up to 300-600 mm. We have been completed the well construction of varied size 6-14 inches to the depth 300-600 mm. with top drive drilling machine and rotary spindle drilling machine with derrick. 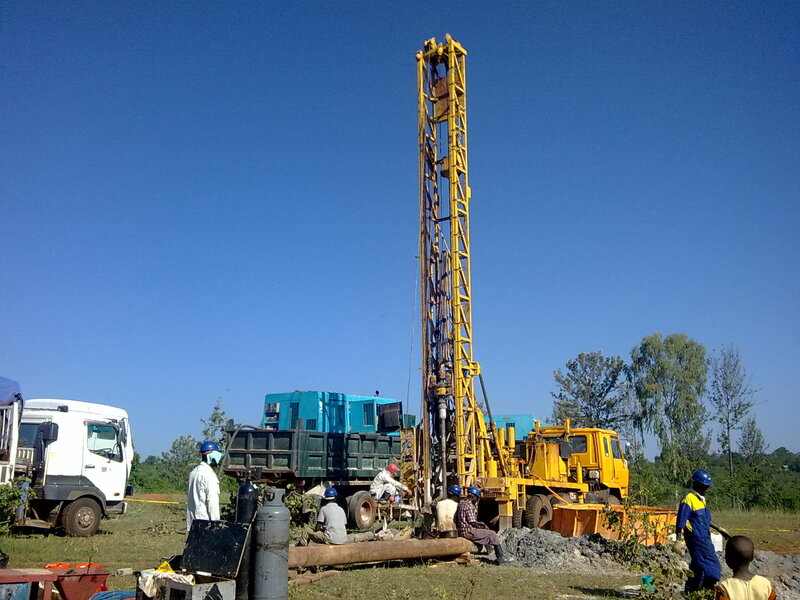 Water well drilling for installation submersible pump to supply water in urban area throughout the world especially in Africa and South-East Asia are our remarkable works including underground water exploration, well development and pumping test. Water well drilling for installation hand pump to supply water in rural area throughout the world especially in Africa and South-East Asia are our famous works. The hand pump has installed including India Mark II, III and Afridev. Reverse circulation drilling is advantage for drilling large diameter of water well especially drilling in boulder. We have various type of drilling machine including rotary table and rotary top drive. One of mitigation of land subsidence in Bangkok and its vicinity is recovery groundwater level by inject water to the aquifer. This water injection well is large diameter and need special technique to eliminate the clog of the aquifer during injection. 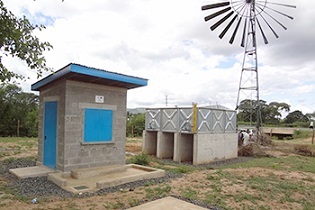 We have numerous constructions of treatment plant and line for water supply system in urban area especially in Africa. This unique is comprise of water well and install with solar pump and solar panel system which not need electrical supply-Therefor, this unique able to use for water supply in remote area especially in Africa. The improvement of irrigation system in Tha Ngon, Laos is our beginning project with the proven result of our construction will lead us to further expansion. Numerous of bridge has been constructed in Africa including Southern Sudan, Mozambique and Togo. With the result of our construction allow us to further expand in numerous countries around the world. We have excellent experiences for construction of temporary jetty for Rubsa Bridge Construction at Bangladesh and jetty rehabilitation for Juba Port at Southern Sudan. And also we have steel pile driving for jetty construction at Riotuba, Philippine and construction of temporary port at Kampot, Cambodia. We have excellent experiences for road construction at Burundi and Juba, southern Sudan. In various project of construction for water supply system its including the construction of control houses and building office. By our proven of construction allow us to further expansion for small building construction work.